Benefits of Traction Clinical Benefits of Traction Therapy Research points to the beneficial effects of traction because it can distract joint surfaces, reduce protrusions of nuclear discal material, stretch soft-tissue muscles and mobilize joints. These effects provide many patients with pain relief from spinal dysfunction. The stimulation of sensory mechanoreceptors that occurs with the application of traction may also gate pain transmission. Chattanooga Clinic Traction provides clinically-proven pain treatment that gets to the root of Cervical and Lumbar Pain, allowing Dr Newman to mimic the feel and effectiveness of hands-on treatment using fully programmable patterns. 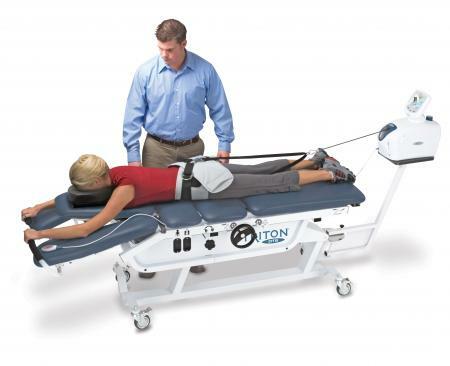 The Triton Decompression Traction System is a vital component in a comprehensive spine therapy program.